Preface: The story behind the painting -- Don't stop to think -- I love the sound of traffic -- In our wildest dreams -- Have you seen the last elite? -- Jukebox: Just tryin' to tell a vision -- The more you learn, the less you know -- Pavement slapping my feet -- Eyes submerge your face -- Caress and spite -- I loved you, and you did, too -- Exhilaration, or, Gorging a neuronic aperture -- Just like yesterday -- Who will Baudelaire? -- Cut it hot, cut it up, cut it clean, cut it slow -- Jukebox: The more you look, the more you see -- Jukebox: We've got your sons' blood on our hands -- Your ballerina curls -- She took the soda pop -- Wine in plastic cups -- The distance that surrounds us -- Jukebox: Don't push me, 'cause I'm close to the edge -- The air is full of air -- Like a party balloon on the Strand -- Jukebox: Calling out, in transit -- Never a time -- Jukebox: Backseat for a bed -- Anyone who had to laugh -- The whole world's dirt -- Newspapers collect on the street -- I want to break your heart -- All around you now the stars are falling down. "Popular music was in a creative upheaval in the late 1970s. As the singer-songwriter and producer Chris Stamey remembers, the old guard had become bloated, cartoonish, and widely co-opted by a search for maximum corporate profits, and we wanted none of it. 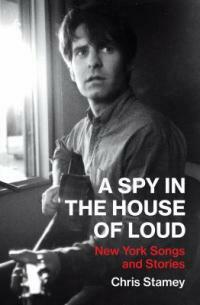 In A Spy in the House of Loud, he takes us back to the auteur explosion happening in New York clubs such as the Bowery's CBGB as Television, Talking Heads, R.E.M., and other innovative bands were rewriting the rules. Just twenty years old and newly arrived from North Carolina, Stamey immersed himself in the action, playing a year with Alex Chilton before forming the dB's and recording the albums Stands for deciBels and Repercussion, which still have an enthusiastic following. A Spy in the House of Loud vividly captures the energy that drove the music scene as arena rock gave way to punk and other new streams of electric music. Stamey tells engrossing backstories about creating in the recording studio, describing both the inspiration and the harmonic decisions behind many of his compositions, as well as providing insights into other people's music and the process of songwriting. Photos, mixer-channel and track assignment notes, and other inside-the-studio materials illustrate the stories. Revealing another side of the CBGB era, which has been stereotyped as punk rock, safety pins, and provocation, A Spy in the House of Loud portrays a southern artist's coming-of-age in New York's frontier abandon as he searches for new ways to break the rules and make some noise." --Provided by publisher. Description: x, 277 pages : illustrations, music ; 23 cm. Rock musicians -- New York -- Biography.